“Because of the HIV virus that I have attained, I will have to retire from the Lakers today,” said then 32 year-old Magic Johnson. It was November 7, 1991 when the world learned about the three-time NBA MVP being HIV positive. Before propelling HIV/AIDS awareness, Johnson had resurrected the popularity of the NBA in the early 1980’s with the help of Boston Celtic’s legend Larry Bird. The rivalry between Johnson and Bird stimmed form their college years. It permeated through their NBA careers, which was an asset to the league that was losing viewership at the time. Johnson played a key role in the Lakers’ “Showtime” era and knew how to ensure that his teammates got on the scoreboard. This resulted in five championship titles within the span of eight years. In the early 1990s, people believed HIV was a disease privy to homosexual men and drug users. Those who contracted the disease would fall ill and die within a year after diagnosis. This led people to believe HIV/AIDS was a death sentence. Johnson gave HIV positivity a new face, a face that would be shunned by members of the sports world at that time. After helping team USA win a gold medal in the 1992 Barcelona Olympics, Magic returned to the NBA. Several players were nervous about playing and different medical guidelines were put in place as told in the book “Dream Team” by Jack McCallum. However, Johnson made an impact on the overall awareness of the disease. 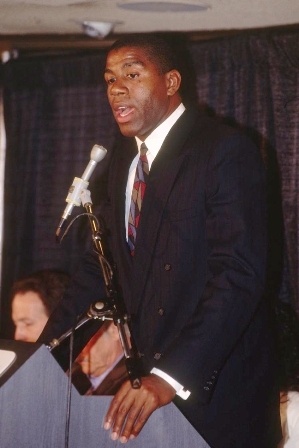 In 1991, the Magic Johnson Foundation was founded; Johnson became an advocate of HIV awareness. He also invested in Los Angeles by creating a movie theatre near the Baldwin Hills mall, owning a Starbucks and Fridays restaurant, and later, becoming part owner of the Los Angeles Dodgers and Sparks as well as starting the Aspire TV network. Johnson detected HIV before it became AIDS; public figures like Arthur Ashe and Eric “Easy-E” Wright were not as fortunate and succumbed to complications related to the virus. Since Johnson’s announcement 25 years ago, the research and treatment for HIV/AIDS has advanced. Those that are infected can live without their health declining at a rapid rate. Early detection is very important, 44 percent of all new HIV diagnoses in the year of 2014 were of Black descent. A person in California has a 1 in 102 chance of being HIV positive, according to the Center for Disease Control. Magic’s career displays the importance of using protection and getting tested.